I know how easy it is to become overwhelmed with responsibilities and let little things slide by. But it is those little things that can bring so much joy to our existence. Last Friday night, I gathered the strength - after a very long day, and went to the Best of the Bard where 23 of our Upper School students performed Shakespeare monologues. I was rewarded with amazing performances, leaving me feeling enriched and humbled by these students’ accomplishments. It takes a lot of courage and motivation to memorize and learn how to deliver a Shakespeare monologue. Most especially when it isn’t even required. This Saturday, February 2nd, Middle School students will demonstrate their courage and talent when they participate in the Coachella Valley Middle School Monologue Festival. Our campus is hosting this event from 8:30 am - 3:00 pm where students from 6 valley middle schools will be performing before judges. We are expecting 67 students and their parents and families, but all are welcome to come and enjoy this fulfilling cultural event. Whether or not your student is performing, please consider joining us in supporting these incredible young talents. Friday, February 8th is a Special Awards Assembly where 5th through 12th graders who earn Honor Roll or High Honor Roll will be recognized. You are invited to attend the assembly which starts at 8:15 am in the gym. Our next dinner out event is coming up Wednesday, February 13th at The Slice - Rancho Mirage. Present the flyer or mention Palm Valley School and 20% of your purchase will benefit the Parent Association. Valid for dine-in and takeout from 11 am - Close. Session 4 of our hot lunch program begins Monday, February 11th. Please print and complete the new order form and return to your division's front desk by Thursday, February 7th. 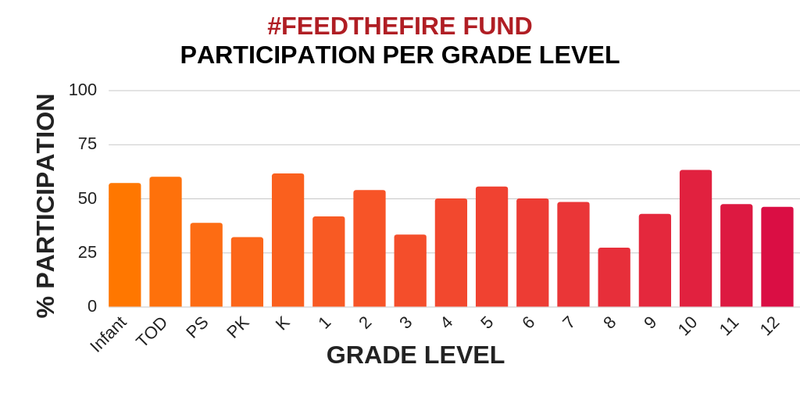 #FeedtheFire Classroom Competition - 2 DAYS LEFT! There are just 2 DAYS LEFT to make your donation toward qualifying for our Family Ice Cream Social this Friday, February 1st! You can give in person by visiting the Business Office or online at www.pvs.org/support-pvs/annual-fund. Currently, our 10th grade class is in the lead with 63%, followed closely by Kindergarten at 61%.